Simplifying the collection of late fees on outstanding payments, late fees can be automatically charged on overdue payments based on customizable rules. Fees can be pre-set dollar amounts or a percentage of the overdue amount. Administrators can also set up tiered late fees; for example, a one-time fee can be charged a certain number of days after an invoice becomes overdue, followed by recurring fees on a different pattern. Program Admins have the option to identify prerequisite events on courses, where an attendee must have enrolled in at least one of the related prerequisite events before an in-person enrollment will be allowed for the attendee. For example, before a parent can enroll their child in before and/or after Art Camp activities such as child care, the child must also be enrolled in Art Camp. If a potential attendee does not meet prerequisite event requirements, staff with override permissions will be able to allow the enrollment, and staff without override permissions will be prevented from enrolling the customer in the event. Future phases of this feature include online enrollment prerequisite event restriction enforcement, defining prerequisite event outcome status (completed/not completed), and multiple event prerequisites (for example, a child must have taken “Preschool 1 Swimmer” and “Preschool 2 Swimmer” before enrolling in “Preschool 3 Swimmer”. Flexible amount items can be created with no set price. Staff enter the price of the item when the item is added to the cart. This is useful for items such as receiving donations, selling Gift Cards for variable amounts or accepting revenues from vending machines, lockers, etc. Flexible amount items are not governed by the permission to adjust the price of other POS items, so they can be added by any staff member whose profile includes POS permissions. Previously, cancellation reasons were global and could be selected for any type of cancellation. Now, Admins can define specific cancellation reasons for Courses, Memberships, and Facility Rentals so they more closely match the business reasons for canceling each item. This allows for more detailed reporting on cancellations. 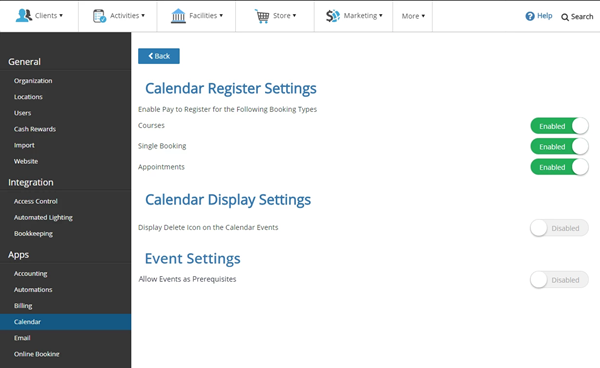 Administrators are able to amend past Custom Booking dates. This allows staff to take manual records of missed sessions and make changes to charged sessions retroactively. Previously, a membership could apply either a flat rate (tax included) or multiple fees. Now, we support multiple flat rate fees, simplifying the membership purchase process. The fee applied to the membership purchase transaction will be based on the customer that will be using the membership. We have added the option to deactivate the ability for customers to sign up or log in with their Facebook accounts. A pop-up window appears when a customer creates a new account online to notify them that their account has been created and their temporary password will need to be reset. Clients can now direct their customers to fill out waivers online through the "My Info" page on their online portal. When registering customers in person, staff are now able to bypass any customer questionnaires that are required for online registration. This makes the in-person enrollment process more efficient and will eliminate staff answering questions on behalf of customers. The Staff Payment Estimate report now has a detail view showing the amount each registrant contributes towards both the total Course Revenue and the total Extra Fees.